Foiled images are super fun to make. 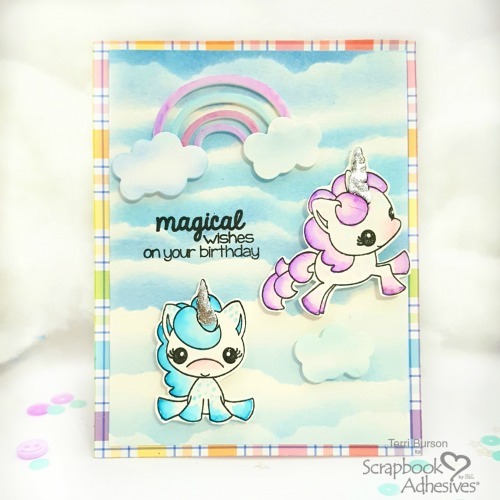 Pair foil with stamping and 3D Foam adhesives and you have a little magic going on! Hello, Terri here, wrapping up your weekend with a fun, creative project. 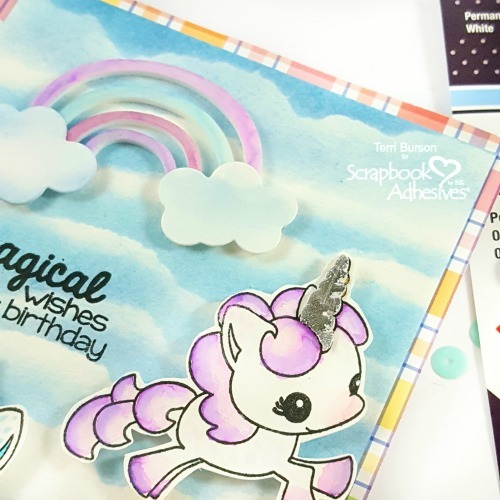 Today, I’m going to show you how to stamp onto adhesive foam sheets to create your own custom 3D foiled images. I’ve got a three-minute technique video as well, so grab a cup of coffee and let’s chat! All the basics will be covered in the video. In a nutshell, we’re going to stamp onto 3D Foam Creative Sheets, fussy cut, then foil. Easy, right? I thought it would be fun to color the rainbow from the 3D Foam Garden Shapes. Simply remove the adhesive by sprinkling baby powder on the exposed adhesive. Gently rub, then tap off the excess. I chose Distress oxide inks and a water brush for coloring both the rainbow and unicorns. Can we say multi-tasking? This stamp set comes with three different unicorns. 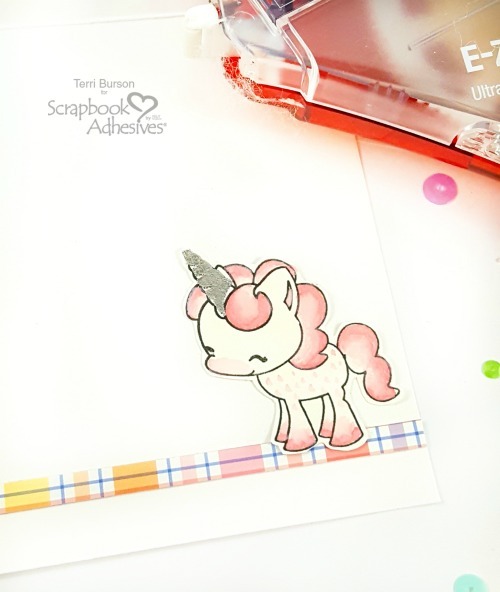 I stamped and saved the third colored unicorn for the inside of my card, along with a strip of that yummy plaid paper, pictured above. Both are adhered with my E-Z Runner® Grand Refillable Dispenser with the E-Z Runner® Grand Ultra Strong Refill cartridge. The remaining elements are popped up, courtesy of the 3D Foam Circles White Mix, for added dimension. If you’d like to see how I created that cloud background, get details on my blog, Waving My Wand. You’ll find a full list of product links as well. This entry was posted in 3D Foam Circles, 3D Foam Shapes, Adhesives, Cards, Crafts & Tutorials, E-Z Runner® Grand, Intermediate, Permanent Adhesive, Skill Level, Spring, Summer, Tutorial and tagged 3D Foam Circles White Mix, 3D Foam Creative Embellishment Kit with Foil, 3D Foam Creative Sheets Mix, 3D Foam Garden Shapes, Card, Card Making, E-Z Runner Grand Dispenser, E-Z Runner Grand Ultra Strong Refill, Foil, Terri Burson, Tutorial, Unicorn, Video, Video Tutorial. Bookmark the permalink.